I'm all about the homemade Halloween costume. I love the entire creative process- deciding on a costume, choosing materials, and putting it all together. I wait all year for it. That's not to say I wouldn't buy a costume from the store; I just prefer to make them, so long as my kids want me to, and provided I have the time. There's one week left until Halloween, did you know? This is about the time when good intentions and half-made costumes are scrapped and the Halloween aisles are flooded with people hoping to get there before their options are limited to a skanky Tootsie Roll and the Power Ranger no one likes. So let me just say here, I originally intended to post this, oh, a week ago. It's been one of those days after one of those days after am I seriously having one of the days again? Life, right? But! 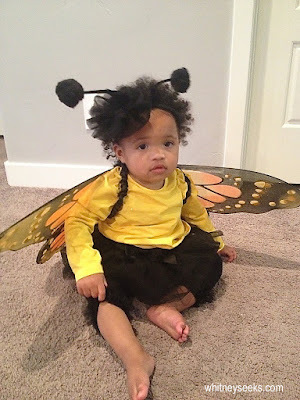 Even with all of those days piling up, there is still time to put together a wonderful, homemade Halloween costume. I've done it in a time crunch more than once. Start with cozy. In my neck of the woods, Halloween night is often cold. You plan your costume knowing there's a good chance you'll be wearing a sweater over it and where's the fun in that? I like to start with a warm base layer to begin with. Sweatsuits and thermals are incredibly versatile, allowing you to add all your finishing touches while keeping the costume warm and comfortable, without compromising your vision. Make accessories the main focus. Hats are usually an add on, to finish off the costume; why not let it be the costume? 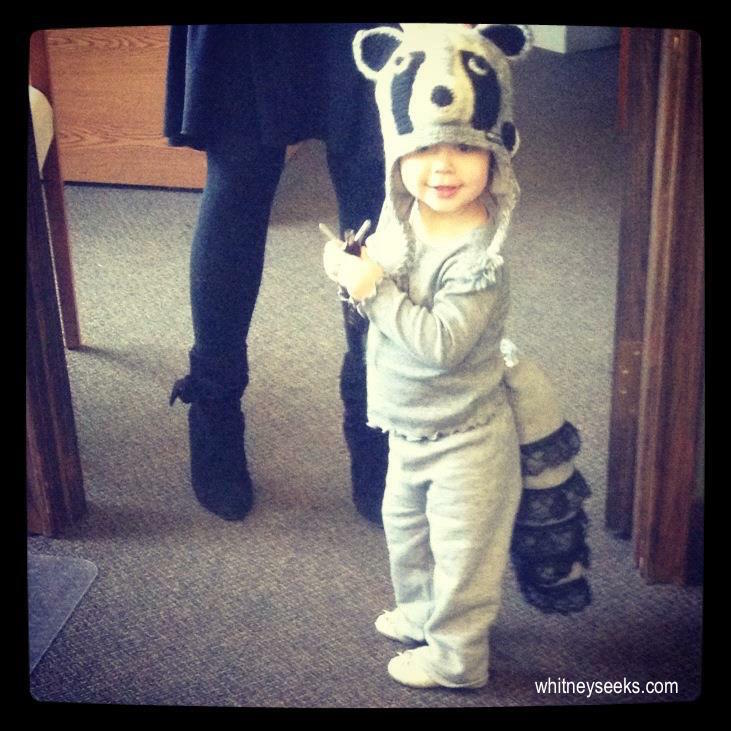 My oldest went as a raccoon one year. Her costume was simple- grey sweats and a warm knit hat I picked up that was slightly more expensive than I would normally spend on costume accessories. Seeing how every piece could be used again on its own after trick-or-treating, however, made it worth spending the extra money. Make it work. I have spent weeks scouring shops looking for just the right shade, or something that just matches what I envision in my mind. The truth is, I could have easily made what I needed with what I had on hand. 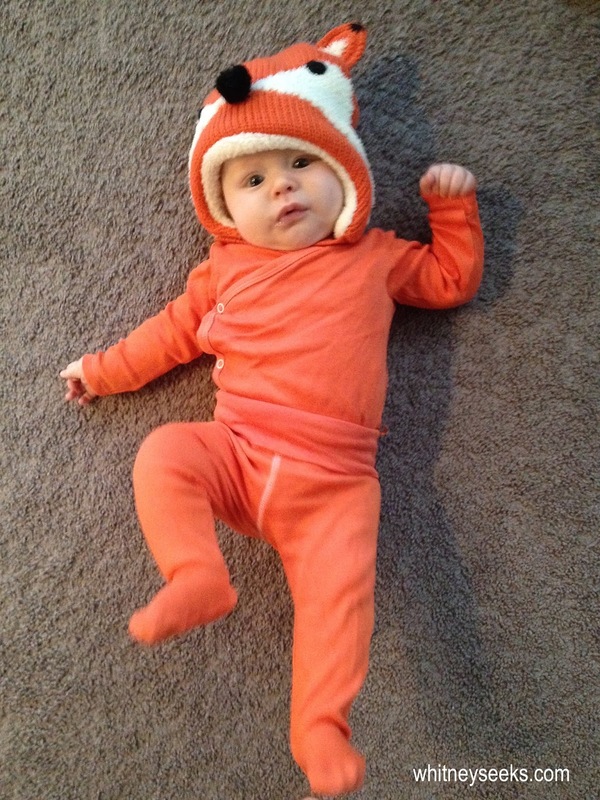 Last year, my baby boy went as a fox. I searched everywhere for just the right orange outfit to go with his hat (see tips one and two ;) ). 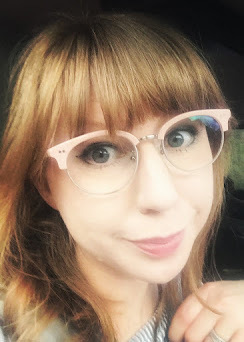 I finally found something that would work and ordered it, only to have it arrive the day before Halloween and not even close to being orange- pale peach was more like it. So, I grabbed a bottle of RIT and wa-la. H&M and Old Navy usually carry white tops and bottoms for little ones, that can easily be dyed. Hot glue. I would love the time to sew everyone's costumes from scratch each year. I really would. I'm sewing them this year, but it's required squeezing every spare minute I can out of the day. Last year, the thought of sewing them didn't even cross my post-partum, frazzled mind. I can't sing its praises enough: when it comes to homemade costumes, make hot glue your very best friend. Modernize it. Who says Dorothy needs ruby slippers when you already have red sneakers. (Sneakers are far more practical for walking that yellow brick road, anyway.) Search your closets and you'll find you most likely have everything you need to modernize any character.